Winter break: a season of life I usually reserve for rest, relaxation, and binge-watching my favorite TV shows on Netflix. Contrary to my usual plan, this winter brought me the pleasure of working not one, but two communications internships. When I set out on my job search, I would have been satisfied with any job. However, the alignment of the stars and a little persistence in the application process led to these exciting opportunities. Throughout the week, two of the three workdays I spend in UD’s own Office of Communications and Marketing as the content manager for ‘Blue Hen Says’ social media sites. Though as a student in the digital age social media savviness tends to come naturally to an extent, I knew much less than I originally thought. Being a content manager required hours of research on how to effectively use social media not only for professional use, but more specifically for higher education. As fellow Blue Hens already know, Winter Session usually turn campus into a ghost town. However, my responsibilities lied in showing students the exciting things happening at UD when it’s much less populated. We strategically planned Facebook posts for weeks at a time, coming up with campaigns for exciting events such as the Camelback Mountain Ski Trip. On warmer days (and when I say warmer, I mean above freezing) I was free to explore campus and take photographs for posts: snowy scenery, fundraising for Greek philanthropies such as UDance, and students trying to stay warm! Throughout the internship, staying updated on any and everything on campus marked the most difficult part of my job. At a large university like UD, finding information takes effort when there are so many details behind each event, achievement, and news story. Furthermore, pushing through the challenges proved a worthy task: feedback from followers showed we were doing something right! Though there’s so much more to social media management than I thought, it was a fun way to break into a part of PR that effectively reaches wide audiences, especially that of my colleagues! The other three days a week of my winter experience took place at the American Diabetes Association (ADA), a non-profit organization based in Wilmington, Delaware. I never worked in a city before, so this began an exciting, yet somewhat intimidating new adventure. Though I started this internship with some experience in my communications tool belt from a summer job, I knew there was much more to learn. The ADA epitomizes a small work environment: only five of us make up the dynamic team. However, what it lacks in size it makes up for in character. My fundraising and special events manager, a recent graduate herself, immediately took me under her wing to show me the ropes; I accompanied her on meetings with potential event team leaders and administrative volunteers. The passionate and loving staff made every effort to show me the reason for our work: the mission of finding a cure for diabetes and improving the lives of those affected by the epidemic. 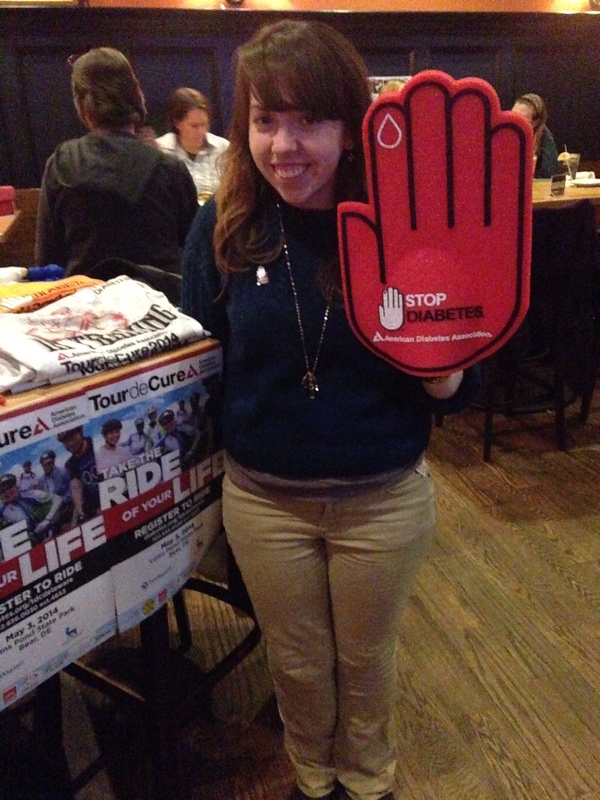 My responsibilities revolved primarily around planning and promoting one of our biggest events of the year, Tour De Cure, a cycling event to raise community awareness and involvement, as well as funds for diabetes research and treatment. I learned how to use to create promotional fliers and e-newsletters, which sparked my previously almost non-existent creativity. Non-profit organizations such as the ADA focus on fundraising and donations to fuel their services and features, so as public relations pro in-training, this meant creating and managing relationships with our publics, showing them why the ADA is important and how they could help us make a difference in the community. The most challenging part of this job comes from the pressures of working under a deadline. In event planning PR, be prepared to work your tail off for several months or more before your event. For our Tour de Cure event in May, we already needed to work out every detail, have a set communications plan with goals in mind to accomplish every work day. Though minimal time proposed a challenge, I find it creates an exciting, motivating work environment. My favorite part of the job stems from the passion my co-workers aroused in me, not only for the cause we support as an organization, but also for my career. Seeing the fruit of my labor and receiving feedback from my team identified some of my strengths and ways I can continue to grow as a professional. I found a work environment in which I feel comfortable and plan to pursue in the future of my career. Brooke is a junior mass communications major with advertising and English minors. In addition to PRSSA UD, she is also a leader in InterVarsity Christian Fellowship and a brother in Alpha Phi Omega. Follow Brooke on Twitter using @brookelemunyon.